Located in the heart of Oregon’s Willamette Valley, Oregon Turf & Tree Farms is a family owned-business, which has been constantly growing and evolving since it’s inception as a grass seed farm in the 1940’s. The Early Years– The beginning of Oregon Turf & Tree Farms was in 1942 when the farm was purchased by the DeArmond family. Grass seed, clover and wheat were the primary crops. Seven decades later, the third generation of DeArmonds are involved in the daily operations of the farm. 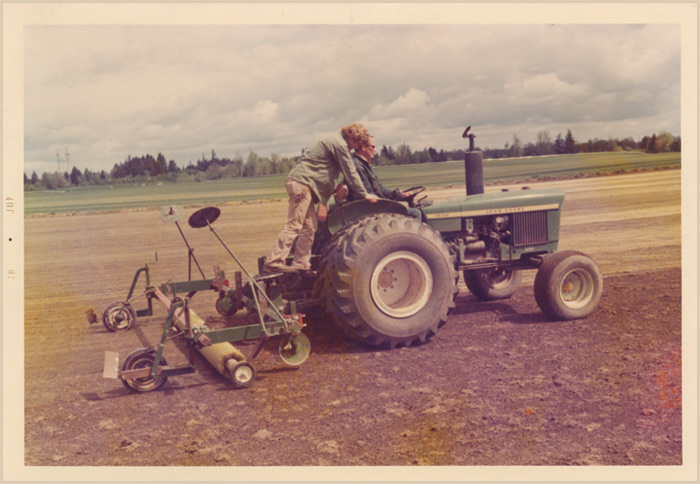 The 1970’s– In 1973, the acres of seed gave way to acres of turf and the farm was officially named Oregon Turf Farms. “Instant lawn” was a new market; owner Tom DeArmond accurately predicted it would catch on and be profitable. The 1980’s– In the 1980’s the name was changed to Oregon Turf & Tree Farms as deciduous trees were added, helping to change the farm to the 750 acre comprehensive business it is today. The 1990’s– In the mid 1990’s we began to sell sod in “big rolls”, 42 inches wide and 100 feet long. With the aid of specialized equipment, large sections of sod can be unrolled in a fraction of time. The 2000’s– In 2000 we added pot-in-pot trees to our inventory. The advantage of these pot-in-pot trees is that they are available to our wholesale customers year round. Most recently we added Tall Fescue. Sod is still our primary product.We sell palletized rolls of Perennial Ryegrass sod to landscapers and homeowners throughout western Oregon and southwestern Washington. Trees continue to be an ever-growing segment of our business. We currently have over 400 acres of trees planted with over 90 varieties of Japanese Maples, shade, and flowering trees with calipers of 1.75” to 4.5” available in B&B. We also grow a wide variety of containerized shade and specimen Japanese Maple trees in calipers ranging from 1.50” to 3”.